In Parashat Tazria we are introduced to a skin disease of biblical proportions called tzara’at. Most people know it as biblical leprosy. However, as we mentioned in our previous commentary on this portion, it is completely unrelated to what we now know as leprosy. Tzara’at is a malady that affects not only the skin, but can also affect clothing, and the walls of a person’s home. It could begin as a moldy looking spot on a person’s house and end up as scab-looking blotches on his skin. As we discovered, the primary way tzara’at was contracted was through lashon hara (evil speech). A person who continually gossiped and spoke destructive words about others would eventually become afflicted with this disease. With this in mind, studying the laws of tzara’at is an opportunity to remind ourselves of the damages of speaking ill of other people and how important it is for us to guard our tongues. Too often we forget about destructive nature and the severe damages lashon hara can inflict. The Talmud says that lashon hara kills three people: the speaker, the listener, and the one who is spoken of (Arachin 15b). How so? It kills the person speaking because it damages their reputation. They become known as someone who is malicious and uses information to harm others. It kills the listener because it alters the way they perceive other people. It kills the one spoken of because it damages their reputation. The prophet Jeremiah compares the tongue to an arrow, saying, “Their tongue is a deadly arrow; it speaks deceitfully” (Jeremiah 9:8). Why? Unlike a sword, an arrow can can be deadly even at a distance. A person does not need to be in close proximity to be wounded by arrows. They merely have to be it the path of the flying object. But an arrow has range limitations. It can only travel so far. The tongue (i.e. lashon hara), however, has no limits on distance. It can travel around the world and pierce an unsuspecting heart without any effort at all. We must also remember that lashon hara isn’t just slander or speaking lies about someone. Our speech can be considered lashon hara even if it’s true. It’s easy to criticize and backbite and think we are just relaying “the facts.” However, we shouldn’t even consider speaking negatively about anyone unless it is vital to the protection of someone else. 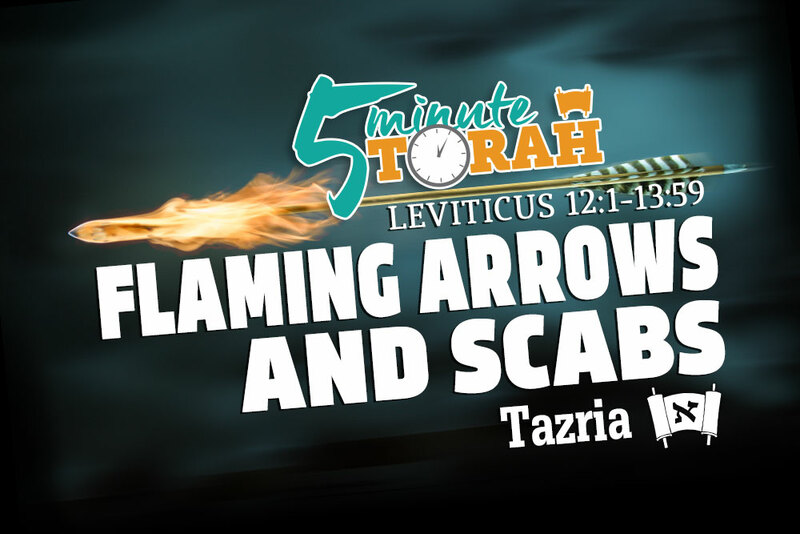 Parashat Tazria isn’t merely about scabs and ritual impurity. It can also teach us about how we speak of others. The next time you are tempted to speak something negative against someone, remember that you are about to launch a flaming arrow that will land much farther away than you anticipated, and wound more people than you intended. And once it lands, the fire will spread and consume both the innocent and guilty alike. Why not extinguish that arrow and put it back in the quiver? It’s much safer for everyone.